These Championships were conducted in Florida, only two weeks after a cyclone had ravaged the area. The organising committee did a splendid job in getting the venue ready all countries arrive at the venue later than expected. As with any post Olympic year, the number of retirements was high. Also at least three of of key rowers needed a year off to manage studies and other commitments. Hopefully they will return in 2018. The Australian team was the first after the introduction of the National Training Centres - the Reinhold Batschi NTC in Canberra for the men and the Hancock Prospecting Women’s NTC in Penrith. It was also the first year under the new head coaches, Ian Wright - men, and John Keogh - women. The headline result of 2 golds and a bronze in Olympic events and a gold in a Paralympic event was good. The additional two silver medals in non-Olympic events added to the good result. Unfortunately there were some disappointing results. Australia finished third on the medal tally. Full medal table on this link. Performance Director, Bernard Savage said: “This a positive start to the new Olympic and Paralympic cycle. For the team to have achieved six medals, including three golds is a good boost for our young team as we continue to develop our National Training Centres and CampaignNumberOne. 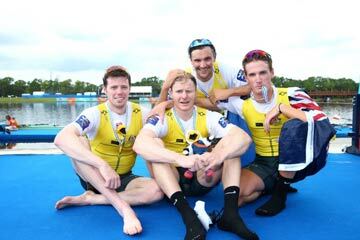 The Lightweight Men’s Quadruple Scull of Cameron Fowler, Redmond Matthews, James Kerr and Hamish Parry, finished sixth in the B-Final and therefore concluded their World Championships campaign ranked 12th overall. David Watts and Luke Letcher finished fifth in their C-Final to wrap up their World Championships campaign ranked 17th in the world. The Men’s Coxed Pair were the first Australians to take to the water in an A-Final at the 2017 World Rowing Championships. The race favourites were no doubt Great Britain who have won this event for the last two years; however, Wruck, Widdicombe and Rook had other plans in mind. The young crew, competing in their first senior World Rowing Championships, shot out of the start to take an early lead that by the halfway mark was a clear water advantage over their closest rivals. As the crews came into the final 500 metres, the race flipped around with Hungary sprinting up on the outside to overtake both Great Britain and Germany and nipping on the heels of the Australians. As the crews surged for the line, Hungary pulled ahead of the Australian crew to take gold, with the Australians taking home the team’s first medal of the event, a silver. Post-race, coxswain James Rook said: “Coming through the race we didn’t know where we were going to sit and coming out of the 500m we found ourselves ahead and we went for it right to the line but credit to Hungary, they did a great job. The Men’s Four started Australia’s golden morning in Sarasota, taking on reigning World and Olympic Champions Great Britain, as well as an in-form Italy in what was to be one of the top races of the day. Australia flew out of the start; rating at 43 strokes per minute with 500 metres gone and put themselves well at the front of the pack as the race progressed. Taking a clear water advantage over Italy and Great Britain, their closest rivals, the crew stroked by Alexander Hill were the fastest boat on the water. As Hill, with Jack Hargreaves, Spencer Turrin and Joshua Hicks upped the rating to go for the line, the Italians followed suit but they had run out of water, Australia had crossed the line in first to claim gold. “It means a hell of a lot to be crowned a World Champion. I came pretty close to winning an U23 World Championship and I don’t think it’s really sunk in yet that we have won, it’s amazing,” admitted Jack Hargreaves. An emotional Spencer Turrin said post-race: “It means heaps to me, I’ve been trying for a long time to try and win something so this feels really good. To get something back after last year’s disappointing result in the Men’s Pair in Rio, this feels really good. “It’s been the best year of rowing I have had in terms of the vibe around the place [the National Training Centre]. It has been a really enjoyable year and to have been able to do something that nobody has been able to do since 1991 is really good,” said Turrin who was born the same year that Australia last won a Men’s Four World Championship. 2016 Rio Olympic silver medallist in the Men’s Four, Alexander Hill, admitted the crew’s win would not have happened without the support of Men’s Head Coach, Ian Wright. “I’ve had a fair few second places so it feels great to have won gold. This group of guys have made it easy for me this year as you know they’ll turn up to training and give it their all, you know what you’re going to expect from them. With that comes consistency and with a new coach in Ian, it has been absolutely unbelievable for us. “We back him to the hilt and we believe in everything he says, as a crew and team we have full buy in which makes it easy to do what you have to do for the team,” admitted Hill. The Men’s Eight only qualified for the the B-Final finishing second to Great Britain. It was a young crew, with eight senior team debutantes, and so gained invaluable experience. Regardless the result was disappointing. A late lane re-draw due to the forecast of cross wind saw Horrie moved into Lane 5 for his final taking on Paralympic Champion, Roman Polianskyi and an in form Russian Alexey Chuvashev. All three athletes came out of the start firing and the battle for the gold was inevitably to be between these three athletes. As the crews crossed the halfway mark, Chuvashev’s stamina began to falter and Polianskyi and Horrie took the reins. As the two crossed the 1500m mark, Horrie made his move on the Ukrainian and began to sprint for the line. With Polianskyi running out steam, Horrie powered through to gold and his fourth World Championship title. Horrie’s family had flown over to Florida to watch the four-time World Champion race internationally for the first time and the Australian admitted that their presence had helped him power over the line. “It meant everything to have my partner Michelle, and our three children, here at the World Championships for the first time ever to support me. I think maybe in that last 250 metres, when there was nothing left in the tank and it was really hurting, the support of the crowd, the whole Australian Rowing Team and my family got me over that line,” admitted the two-time Paralympic silver medallist. 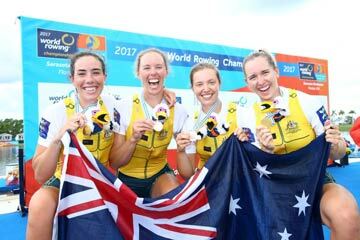 Australia’s Lightweight Women’s Quadruple Scull had won World Rowing Cup 3 in a blistering pace and in today’s A-Final Amy James, Alice Arch, Georgia Miansarow and Georgia Nesbitt went all out again in a bid to claim the World Championship title. The Italians, who are also the U23 World Champions in this boat class, were the crew Australia needed to keep an eye out for, alongside an in form China. As the crews approached the halfway mark, China and Italy were battling it out for first and second, while Australia, stroked by Nesbitt, began to make their move on the tightly packed group, with only two seconds separating the top five boats. As Italy pulled ahead in the final quarter, Australia began to charge, overtaking China and going after Italy but it was the Italians who claimed gold, with Australia taking silver and China bronze. Madeleine Edmunds and Olympia Aldersey were drawn in Lane 4 in their final and were the fastest crew out of the start and were the first to cross the 500 metre line with New Zealand and the USA in hot pursuit; just a second separated the entire field. New Zealand’s Brooke Donoghue and Olivia Loe then did a push through the 750m mark and by the half way point the order had changed, with New Zealand in the lead with Australia right on their tails and the USA holding suit. With the wind switching to tail, the crews pulled into the final 250 metres and the sprint for the line began with New Zealand crossing in first, USA second and Australia taking third. Edmunds admitted that winning her first senior World Championships medal was a fantastic feeling. “It still feels a little bit surreal, it’s one of those races where I don’t really know what I did but we really executed it well and we trusted each other to do what we needed to do and you can’t not be happy with that. “Post-Olympic year, the quality of the racing here at the World Championships has been great. All the racing has been so close here, so it’s exciting to see what will happen over the next four years,” said Edmunds. Aldersey, whose last senior World Championships medal was in the Women’s Double in 2014 added: “I think getting the medal for this year was a good outcome and looking at our progression through the regattas this year it’s great to see that what we’ve been working on has paid off. The Women’s Quadruple Scull, all four of whom have won U23 silver medals in the boat class, took on USA, Great Britain, Netherlands, Poland and Germany. The young crew took on a tightly packed field and were fourth at the halfway mark with Poland in the lead followed by The Netherlands. As the crews sprinted for the line, Australia had dropped back in the field with the crew, featuring three senior team debutantes, finishing in sixth. The Women’s Four have not lost a race this season and today was to be no different for the crew of Molly Goodman, Sarah Hawe, Katrina Werry and Lucy Stephan. The Netherlands had other plans in mind and were the fastest out of the start in the final, leading over the USA, while Australia sat back in fifth place as the crews crossed the 500-metre marker. Australia are known for making their move in the second half of their races and began to push on the Dutch and were joined by Poland and Russia who were all challenging for the podium. In the final sprint, Stephan called to Goodman to up the rating and the crew responded, upping to 43, with Australia surging into the lead to claim gold, followed by Poland and Russia. Sarah Hawe last represented Australia in 2005 in the Junior Australian Rowing Team and the Tasmanian was delighted to walk away with her first Senior World Championship title. “It’s incredible to have won today. You get that sniff of international competition as a junior and then I had a big break away but I always had that urge in the back of my head to keep rowing and sort of knew I had the goods to do it, so now it feels good to show everyone that it can be done,” said the 30-year-old. The youngest athlete in the crew, Katrina Werry, admitted the crew remained focused on their race alone and not on what was going on around them. “It was such an amazing race, we stuck to our roles and just stayed internal to the boat, we weren’t panicked at all. We knew we had to do what we do best and while our legs were tired we knew we had enough and we trusted the training, and everything we have done in the last six months, to come through for each other and we did just that,” said Werry. 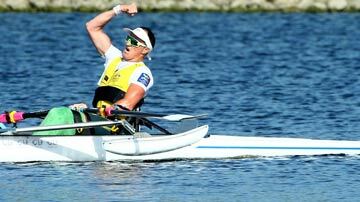 Lucy Stephan added that today’s win was a great base for Australia’s women sweep rowers to grow on. “It’s pretty amazing, I’m still in shock. I knew we could do it but it really is an amazing feeling. It now up to us to keep building on the base we’ve created. This win has provided a great opportunity for women’s sweep moving forward and it’s really exciting,” said the Victorian-born athlete.